Collaborations: Navy, Hanga Roa Hospital, Nanaky yacht -Nautica Rapa Nui, Kayak Rapa Nui, Hotel Hotu Matua, Discover Agency. 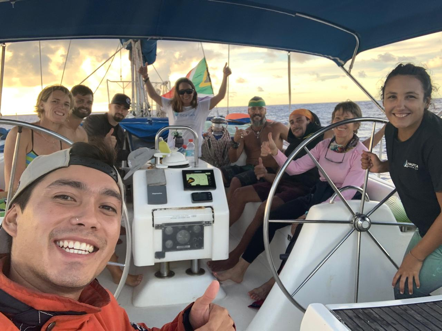 People on board: Sarah Houston, Rentia Denissen, John McCarthy, Marta Vigoroux, Hian Schneider, Juan Gustavo Ogaz, Te Manu ko Nui Gabriel Lillo, Erik Aleynikov, Wofty Wild, Camila Ahrendt. Sarah Houston: Nutritionist for Sarah Ferguson. She is the person who prepares all liquids and food during the swim. She is also the person who personally feeds her every 30 minutes and check Sarah´s status, encourage her and tend to her needs. Rentia Denissen: Personal doctor of Sarah Ferguson. It is who comes before an emergency. John McCarthy: Trainer of Sarah Ferguson. He is the person responsible for Sarah´s safety and all decisions related to that. John accompanies Sarah in kayak and is who makes important decisions. Marta Vigoroux: Captain of the yacht. She has years of experience navigating on boats. She is the one who gave me the exact positions every time I asked for them. She was also the official voice to communicate with the Navy and with the Hanga Roa Hospital. Hian Schneider: Second in charge of the yacht. He is always attentive to the needs of the crew. Wofty Wild: Cameraman of Sarah Ferguson´s team. He made the official photographs of the swim and of the whole experience. Erik Aleynikov: Videographer and in charge of post production of audiovisual material. Juan Gustavo Ogaz (Tavo): experienced local kayaker. He was a key member of the swim who offered local knowledge to make on the spot decisions about the route and conditions. Te Manu ko Nui Gabriel Lillo: experienced local kayaker. Key to offer local knowledge in the face of decision making. 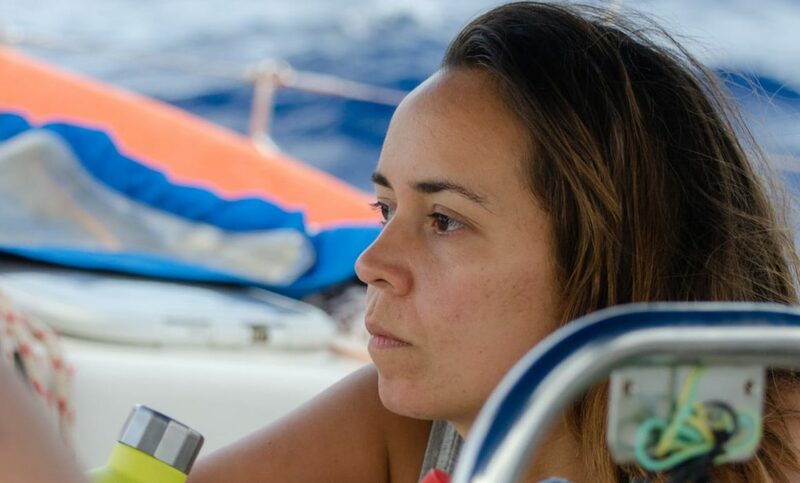 Camila Ahrendt: Only member of Plastic Oceans on board. In charge of the logistics of Sarah Ferguson’s swim. Independent observer (according to the swim protocol). Hours of trajectory: 19 hours 8 minutes. Sarah Ferguson started the swim with Sarah Houston, they look happy and strong. Camera men are focusing on her in this moment. We have been prepared all the things on the yacht. This is what we have been working for for a long time ago… and I’m so happy. 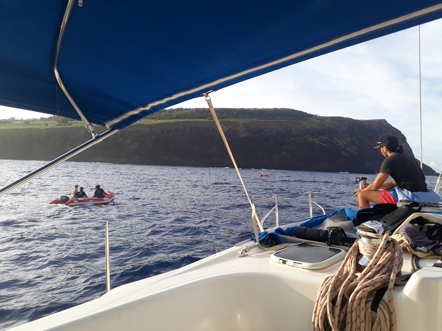 Sarah arrives to the first difficult point of the race, called Rano Kau. Slow wind, the team is working well, there is a lot of energy and we are focused on our job. We are listening to Rapa Nui music. Sarah Houston just came into the yacht again after feeding Sarah Ferguson, and she tells us that Sarah F. is happy. So, if she is happy, we are happy as well. The kayakers change the turn each 1 hour. Sarah are swimming fast, average pace 2 nots or 3.3km per hour. 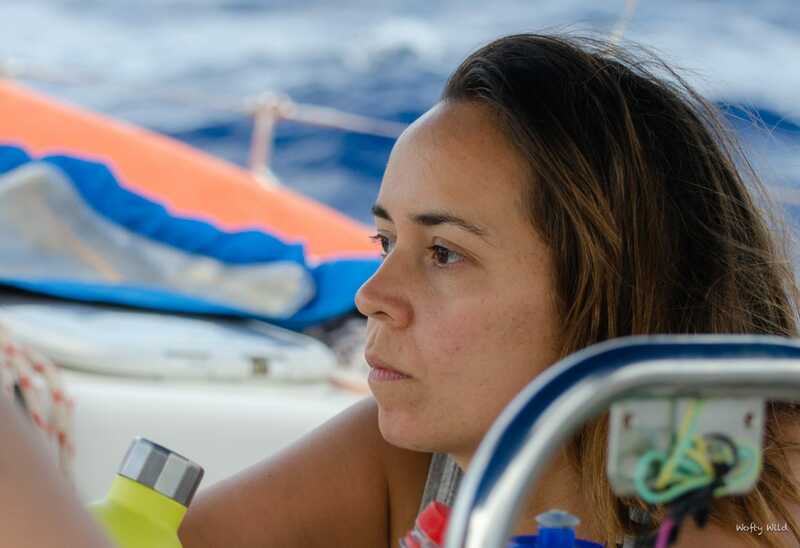 John is focus, Rentia is watching to Sarah F. Marta, the captain, is super fast with decisions, also drives the zodiac and helps in everything. 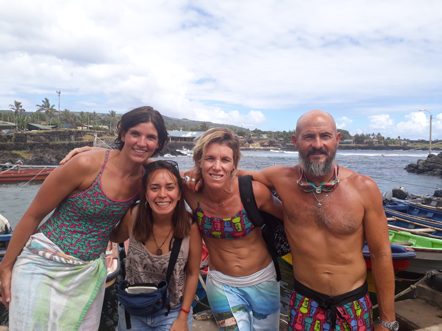 Tavo and Konui are the kayakers from Kayak Rapa Nui and they are so “involved” and listen to John with a lot of attention. We are impressed about the BIG waves crashing in the big walls, the image is scary in some moments. I can’t believe that kayak people are used to kayak in these spots. I would like to know how Sarah is feeling, is she seeing fish? Plastic? Konui watching and preparing for his next shift on the kayak. Sarah F. completed the first difficult point! Much faster than we have been planning. She goes very well, in the same rhythm. We are in front of Vinapu. Sarah F. is happy and a few minutes ago she listened a rock song! Sarah H. went with music in the zodiac to feed her, I don’t know if its AC/DC? Or Metallica? But it sounds great ahaha. The rest of the team is a unit and focussed. Tokerau boat is near of us and we are sailing in average 2 nots. The wind is soft, we feel grateful. We are almost in the middle of Rano Kau and Poike, 2 of the 3 difficult points of Rapa Nui. The sky has a few clouds. Sarah H. told me that Sarah F. is “working hard, not in the entire swim she is top, sometimes she just swim”. We are with north wind, so the waves coming directly for us. We can see the Poike near: The second difficult point. One of the corners of the island, in that point the wind is of all directions and with big waves. There is “Matapari” that means “The eyes of huracan”. We are eating light food, and Sarah H. is preparing the food and drinks for Sarah F. She is swimming fast, strong. I admire her deeply. I see her and I see the ocean and I can feel the connection, the energy…. The Mana is with us, is with Sarah. Great! So, If she is happy, we absolutely are happy. I can see Sarah swimming so fast and always in 2 knots. We are listening to jazz music (wawwwwwwww, imagine that: work for the best swim, yacht, sun, ocean, friends, jazz AND we make the world aware about the plastic pollution … I’m with the right people, I’m grateful). We have been feeling more wind, intense and powerful. Intense wind comes directly to us. We can see more and more close the Poike. The ocean is beautiful, big, deep… Blue in the sky, blue in the water… and Sarah is in the middle. We already can see Tongariki, with the 15 Moai…and the Rano Raraku. The yacht is just in front of them right now. Most of the people can see them in the land, in the National Park, and we can see them from the water. John looks focussed, calm, always watching Sarah. I guess he feels a deep connection right now with the ocean and with Sarah as well. Rentia also looks calm, watching Sarah. The wind is strong. Comes from many directions sometimes and the waves are bigger. The yacht is moving a lot, I’m in the kitchen cooking and doing things are in the floor ajaaj, I guess I have to cook in some other time. It’s better. We already in Poike, Sarah has been swimming in the same rhythm. 4 hours swimming from Vinapu point. We have north wind. And the waves are bigger, the yacht is moving a lot. It’s better not to cook right now ahahaah. I wonder how is Sarah’s feeling? Is she feeling the big waves? The wind? Sarah H. is always happy, good mood. Also a great DJ. We have been listening rock, soul. Such good songs! We are getting closer to the big Poike walls. And the waves are crashing on walls. Sometimes everything is white. We can listen the sound by the waves crashing into the walls. He filmed me in a video, explaining everything that I’m watching. I love to transmit the things that I’m living to the rest of the people. Uuuuuuuuups, the yacht is moving too much. I can’t write any more. A few of the things in the kitchen are in the floor again. We can “listen” to the ocean, because the wind brings the sounds. First group photo taken on board. We just took our first group picture! It’s a happy moment. Suddenly I’m feeling a new sensation… The landscape is AMAZING, the energy is incredible. We are in front of “La Perousse”. We can see 3 hills, Marta tell me the names and tell me that when she was younger, every time that she was watching them, she thought that they were the back of the camels. WAW really, this is amazing. My favorite landscape since the beginning of the SWIM. Green hills, the sunset, the ocean is almost orange and Sarah… swimming against plastic, this is absolutely a great moment for all of us. Sarah H. is preparing all the food with so much love, and I just saw something deeply beautiful. She kissed one of the tuppers for Sarah. She definitely has a good heart. John has been swimming 3 times and he looks fascinated by the colour of the ocean. The moon is amazing, the view makes me feel lucky … Sarah is splendid swimming… she is strong, I send love to her. I talk with Marta and Hian, they are a great people, we are connecting by the humor. We are talking more with Marta, Hian, Konui and Tavo, they are ao cooperative and always want to help in anything. Sarah is happy with her speed, average: 2 knots. Sarah H. is singing nice songs and I love her good mood. A few minutes ago, everyone were looking at the stars and I was thinking that we are making a dream come true.. Thanks Universe..
“Until the last momento I have followed Sarah´s arms and her stroke, I never let her out of my sight. Everytime that I was cooking, I looked through the window to see how Sarah was doing. She doesn’t needs anything more that her body, her mind, her passion and her soul to complete the swim.. and EVERYTHING is for talking to the entire world about plastic pollution…. I admire her and her team so much. And some of the best things that I have seen on board is the deep love that Sarah’s team feel for Sarah. We are near the north point of the island. THE LAST DIFFICULT POINT that we have been studying . The yacht is moving more than never. There is a strong wind, here we can feel the power of the ocean! I wonder how is Sarah, can she feel the wind? In front of the island (on the right from the yacht) we can see a BIG storm coming directly to us! Dark clouds are on their way! 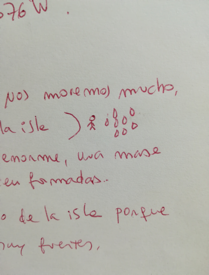 So, Hian and Marta decided to “move away” from the island a little bit, because there are many rocks and the waves are crashing strong. Map from the original notes. L to R: island, Sarah, a storm. WE CAN SEE THE HANGA ROA LIGHTS!!!!! WE ARE SCREAMING! WE ARE HAPPY! EVERYONE IS APPLAUDING. John is kayaking next to Sarah and he also saw the lights! This is a good moment! The communication with the kayak is constant. There is a thing that i’m thinking… I need “THE TOKERAU TO GET CLOSER TO US in case something happens in this last part of the swim” so I ask ti Marta if she can say to Tokerau that we need it closer, so we are talking with them now. Now I’m writing this last point here in the hotel, because the last hours on board were so intense that I couldn’t write anything. “There is a situation in the water… we are worried because the “whistle” has been sounding times than usual, 3 whistles means trouble, an emergency, and we have heard it already twice! The radio is not working, and Marta goes VERY FAST to the kayak! And its particular, because we are super near of Hanga Roa, we can see the lights (I ask Marta “what´s our distance” and she told me “1,7km” … I really want that Sarah feels good. Marta and I sent a message to Carlos, for the ambulance and we also talked with the Tokerau. 1.5km from Hanga Roa, Tavo and John are talking of how to end the swim: Tavo tells me his ideas and I’m translating to John. Tavo says that the best way to end is to be in the beach of Hanga Roa and turn to the left. Because the waves are so big and there are rocks too.